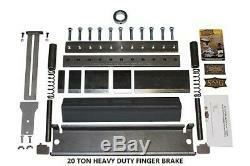 SWAG 20 TON FINGER BRAKE HEAVY DUTY DIY BUILDER KIT. Now in 520mm width to suit the presses commonly available in the UK market from companies such as Machine Mart, Sealey and SIP. SWAG have kindly remanufactured this product for Stakesy's. The previous model was 40mm wider and fitted only very large 50 ton presses available in the UK. Weld up press brake kit from SWAG Offroad in the USA. 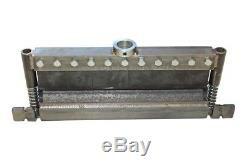 Designed to be used with 20 ton hydraulic presses from Clarke, Sealey and SIP etc. (press not included in price). Kit includes adjustable back stop and side stop for repeatable bends. The top clamping bar is machines from 4140 Cromoly and also includes 5 segmented top tools in the 1", 2", 3", 4" & 9.5 widths. Each segment can be removed or swapped to provide the closest required bending width or to provide access and clearance in restricted areas. The heavy duty kit uses the same high quality construction and number of components as the standard duty kit, just built from thicker 3/8" steel and a wider 4.0" bottom die to allow for easier bending of thicker material. There are a couple of extras available for this kit on the listings below. The standard kit has a wide lower v-die which is great for heavy plate but if you need to put a 10mm return on some 1mm steel sheet the material wont span the v. The flat top kit fits on top and enables you to adjust down to a small bottom tool. Max Capacity at 19 in Mild Steel. Max Capacity at 15 in Mild Steel. Max Capacity at 13 in Mild Steel. Max Capacity at 11 in Mild Steel. Max Capacity at 6 in Mild Steel. Max Capacity at 3 in Mild Steel. 1", 2", 3", 4", 9.5. The item "SWAG 20 TON Finger Brake Heavy Duty DIY Builder Kit" is in sale since Monday, January 14, 2019. This item is in the category "Business, Office & Industrial\Metalworking/Milling/Welding\Other Metalworking Tools". The seller is "stakesys" and is located in Loughborough.